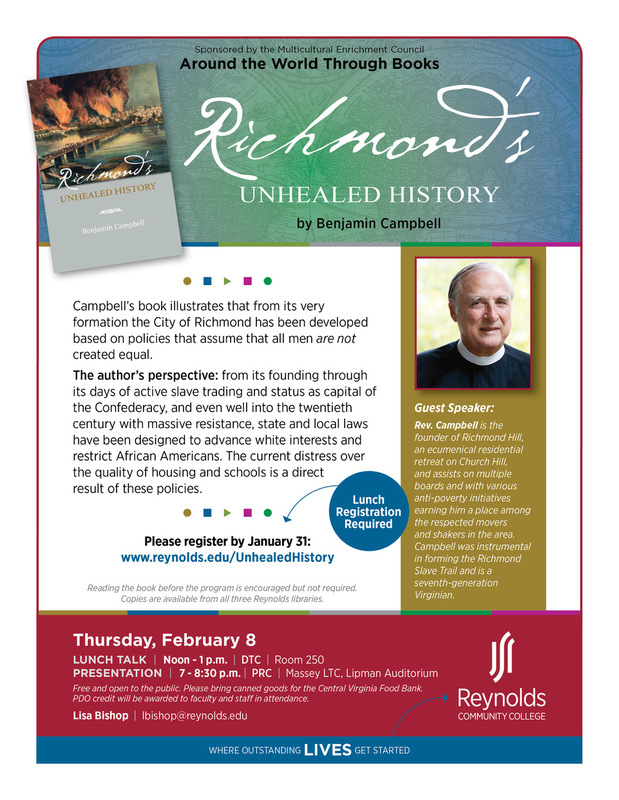 Reynolds to host author Benjamin Campbell during book discussion on “Unhealed History"
Reynolds Community College will host author Benjamin Campbell for an “Around the World Through Books” discussion on Thursday, February 8 from 7 to 8:30 p.m. in the Parham Road Campus Massey Library and Technology Center located at 1651 E. Parham Road in Richmond. This event is free and open to the public. In a detailed look at the history of Richmond, Campbell’s book examines the contradictions and crises that have formed the city over more than four centuries. 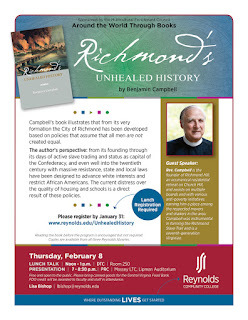 During the evening’s event, Campbell will discuss his hope for Richmond as he believes the city, more than any in the nation, has the potential for an unprecedented and historic achievement – that its citizens can redeem and fulfill the ideals of their ancestors, proving to the world that race and class can be conquered by the deliberate and prayerful intention of honest and dedicated citizens. A native of Arlington, Virginia, Campbell studied political science and political economy at Williams College in Massachusetts, and studied theology as a Rhodes Scholar at the Queen's College in Oxford. He received a master’s in divinity and an honorary doctorate in divinity from the Virginia Theological Seminary. He was ordained to the priesthood of the Episcopal Church in 1966 and has lived in Church Hill since 1970. The program is a free community event sponsored by Reynolds Multicultural Enrichment Council for the purpose of encouraging cultural diversity throughout the Reynolds campuses and communities. I grew up in northeast Ohio—Warren, to be exact. I have lived in Virginia since 2007, but my home is actually close to Williamsburg. I graduated from the University of Georgia with my Ph.D. in 2007 and moved to Virginia with my family to do a visiting assistant professorship at the College of William and Mary. When and why did you get interested in Geology? I have loved geology since I was a child. I had a box of rocks that I collected on walks in the park with my grandpa, or from the gravel driveway at my aunt’s house. For my third grade science fair project, I classified the rocks from that box and it’s been in my blood ever since! 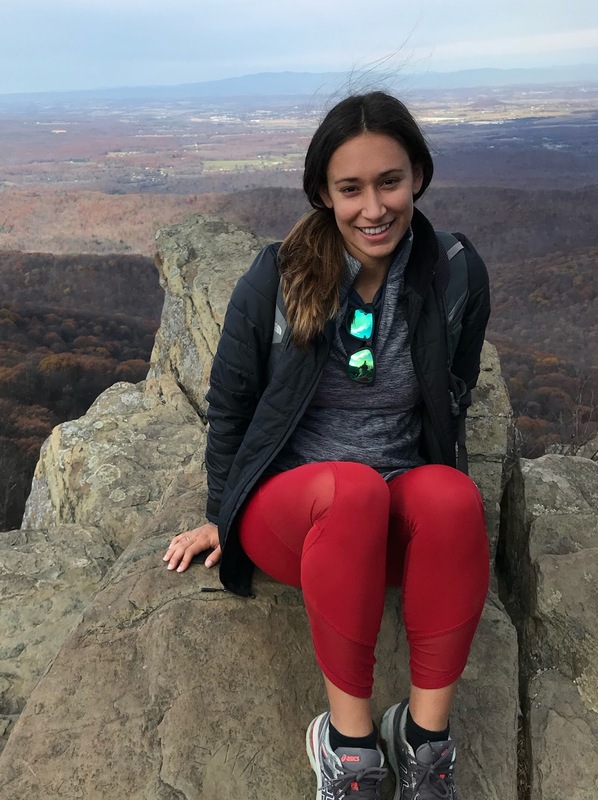 When I started college at Penn State University, I began as an engineering major, but after three semesters, I just wasn’t excited by what I was learning. One afternoon my sophomore year, I stumbled across a mineral museum on campus and it was like finding old friends. I went up to the geoscience department office and changed my major that day! Geology is dynamic and exciting—it’s all about our home, our planet. I am captivated by the history recorded in rocks and fossils. And getting to do research in the mountains or on the beach is pretty great, too! I have been a professor at Reynolds since August 2013. I love it here—I have wonderful colleagues and I truly enjoy getting to know my students. In 2015 you were chosen to participate in a four year National Science Foundation project. How is the project progressing? For the past two years you have been a Faculty Star Award Recipient. What is the secret to your success as a faculty member? 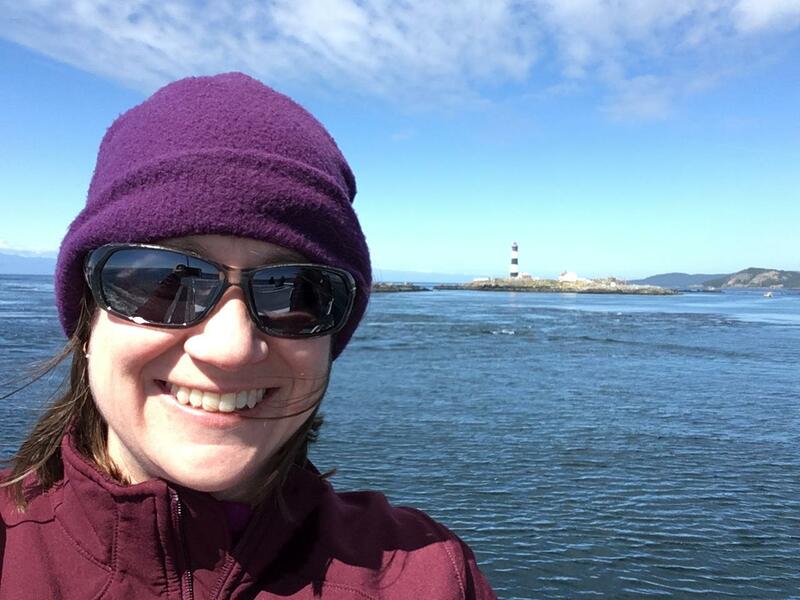 When I first began teaching, I attended an National Association of Geoscience Teachers On the Cutting Edge Early Career workshop for geoscience faculty. One of the reflections we did asked us to think about our favorite instructors and consider what they did well. I most admired teachers who were approachable, genuine, and passionate about their area of expertise. These are traits I try to bring to my interactions with students and colleagues. I love spending time with my family—hiking and camping with my husband and 11-year old sons is a great way to spend a weekend. I also enjoy quiet time on the couch with a cat or two and a great book. I am a big fan of historical fiction. Does it only have to be one place? My students would probably tell you how I mention all the places I need to geologically pilgrimage to someday. Right now, top of the list is Iceland because glaciers, volcanoes, and a divergent plate boundary all in one country must be visited. I also have the goal to get to all of the U.S. National Parks in my lifetime—I’ve done 27 of the current 59 so far. I would also love to spend time on the International Space Station to be able to appreciate Earth from a different perspective—I bet Google Earth isn’t quite the same. If you won several million dollars what would you do with the money? I would invest it in the stock market to generate more funds for philanthropic purposes—my faith community, college scholarships, environmental protection, animal welfare, and public libraries. And I’d probably hit a few more national parks, too. Reynolds recently recognized 61 students who completed the Associate of Applied Science degree in Nursing. Held in the Lipman Auditorium of the Massey Library Technology Center, the ceremony opened with a welcome by Reynolds President Dr. Gary Rhodes and inspirational words from Joe Mazzo, RN, BSN, MA, FACHE, who serves as the Chief Executive Officer at the HCA Virginia John Randolph Medical Center. How long have you worked at Reynolds? Where did you work before coming here? Why did you decide to work in Student Life? I decided to work in Student Life, because I knew after speaking with Cara and Jackie that we all had a similar vision to help create educational experiences for students. My goal has always been to help students get to where they want to be, and try and work around any barriers that may hinder them from getting the education they want. 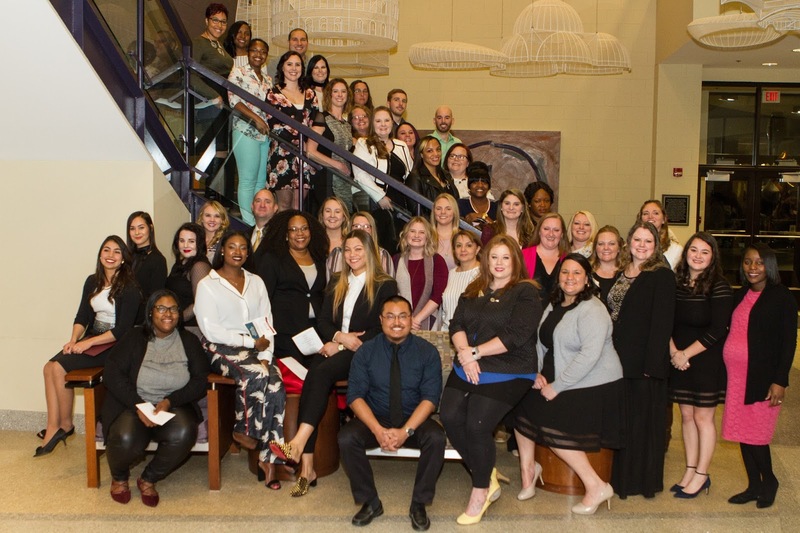 I knew that the leadership, educational, social, recreational and various other opportunities that we provide students, help them grow and learn outside of the classroom and potentially help them get to where they want to be! What do you like best about Reynolds? I get to interact with tons of students on campus, and I really like how diverse the student population is at Reynolds. Each time I interact with a student, I learn something new and I appreciate that students here are willing to share experiences with me. We heard you recently completed a marathon – what motivated you to run a marathon? It was my second, and I really wanted to run the Richmond Marathon specifically, because the course is amazing and it showcases some amazing parts of RVA! I couldn't pass up the opportunity to run a race around my favorite city. I like to run, hike, kayak and be outside all the time! This is the hardest question!!! I'm going to go with Lunch or Supper - because it has a great brunch and dinner menu! Tacos! Continental Divide and Asado have the best tacos in Richmond! Panama! Most of my family lives there, and it's a beautiful country. Who is the one person that influenced you the most when growing up? My mom was my role model and a still is today. What is the oddest job you have ever had? In grad school I was a Secret Shopper for Papa John's. It was awesome, because I got free pizza and a little spending money. If you won the $100,000,000 lottery what would you do with the winnings? I would donate a lot of it to charities, public schools and national parks. I would buy my mom a beach house and make her retire early, because she works too hard! I would pay my student loans off and get my PhD.